Mother's Day is in TWO DAYS! Most of you have probably already made the gifts you are giving. If you haven't made anything yet, hopefully you will get some easy, quick ideas of what you can make in the next two days. There are SO MANY amazing Mother's Day projects out there. Here are just a few I've seen. Make your mom a handmade card using scrap material and your sewing machine! It doesn't get much better than that! Aren't these simple cards made at Kojo Designs adorable? Go HERE to see more about them. HERE is a gift for all you procrastinators out there (like me!) 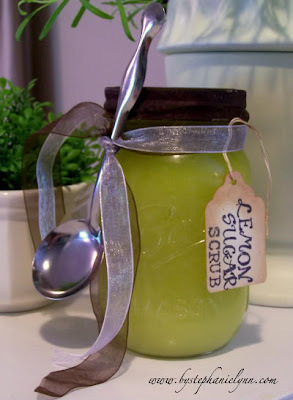 Just a few common ingredients mixed together and you have a sweet smelling scrub for those ruff areas on our bodies. Under The Table and Dreaming has the recipes for a Lemon Sugar Scrub HERE and Vanilla Brown Sugar Scrub HERE. My mom would love either of these! If you're looking to sew something beautiful and feminine, check out this bouquet of flowers shirt at Ruffles and Stuff. You (and your mom) would look classy and delicate in this type of shirt. Go HERE. If your mother is a grandmother, this seriously is the perfect gift! 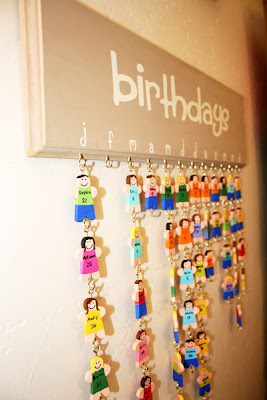 Remind her of all her family members (kids, grandkids, great-grandkids) and their birthdays with this fun birthday board. See it HERE from A Little Bit of This...A Little Bit of That while she guest posts at Poppies At Play. This is one gift a mom would absolutely cherish! Pictures of her kids spelling their favorite word. Make it for your sister (with pictures of her kids, silly) or tell your husband to do it for you! Visit Ready, Set, Create to read more about it! GO HERE. Every mom loves some accessories!!! I love this brooch with three different kind of flowers. Pin on a shirt or bag, it's gorgeous! Go HERE to The Scrap Shoppe to see how to make it! Pamper mom by making her some spa-like slippers and giving her a pedicure! A nice long massage would be nice too! See how to make these at Pickup Some Creativity. Go HERE. Please join your crafty post if, and only if, it corresponds with the category and theme of Mother's Day. (If it doesn't fit in this category, please link it up to Whatever Goes Wednesday.) 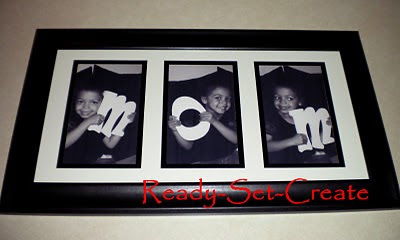 Link up crafts, decor, sewing projects, food, tips, etc, that has to do with Mother's Day. If you have joined a Mother's Day project to a party on my blog before, feel free to add it to this show too! If you have a lot of Mother's Day projects, please choose your favorites. (Please no more than 4 posts per blog). Link to the specific posts, not to your main blog page. I need some quick ideas because I haven't made anything yet. Let's see what you have! thanks for the fun party - can't wait to see what everyone links up! I love the things you featured! Thank you for featuring my Mother's Day Brooch! Love all your other features. Will have to mark them for future holidays!! I just love all the parties you host and the collections you feature. Happy early Mother's Day all. Thanks so much for your sweet comment and for reminding me about the party! I linked up! I love Mother's Day gift ideas. Thanks for hosting this fun party. I printed off both of your scrubs. I have Mothers day covered, but this will be great for gitlfriends!! !